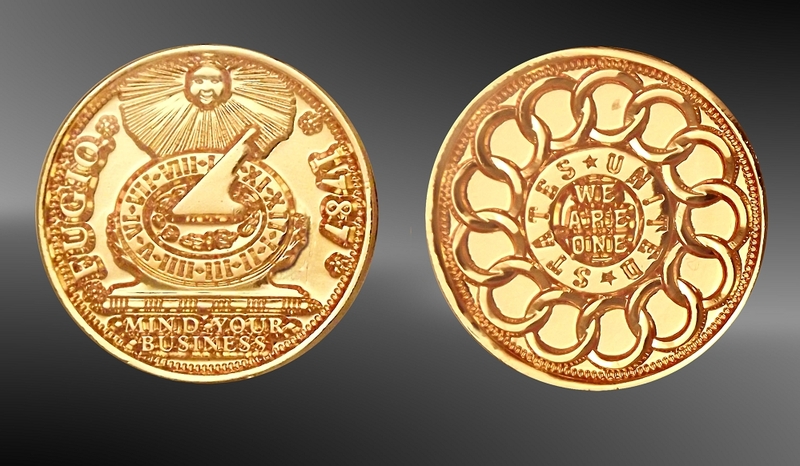 These unique cuff links feature a pair of gold plated coin replicas of the original US 1787 Fugio cent. The swivel mechanisms are goldtone. Coin surfaces are protected with Aurista's exclusive LensCote clear polymer. Along with the newly drafted 1787 US Constitution, congress authorized America's first coin, the Fugio Cent. Now one of the rarest US coins has been beautifully replicated by master engravers to re-celebrate America's most important document, the US Constitution. Resized from its original penny dimensions to that of a standard US Nickel, the obverse is emblazoned with a sundial, Fugio (I Fly) and "Mind Your Business." Some theorize Franklin's meaning to the latter phrase to be "Time flies, so mind your business." Others see it as a motto reminding us to keep government out of our business, like the message to King George of "Don't Tread on Me." The reverse inscription shows "We Are One" in a 13-link chain representing the original states strengthened by their new republic. 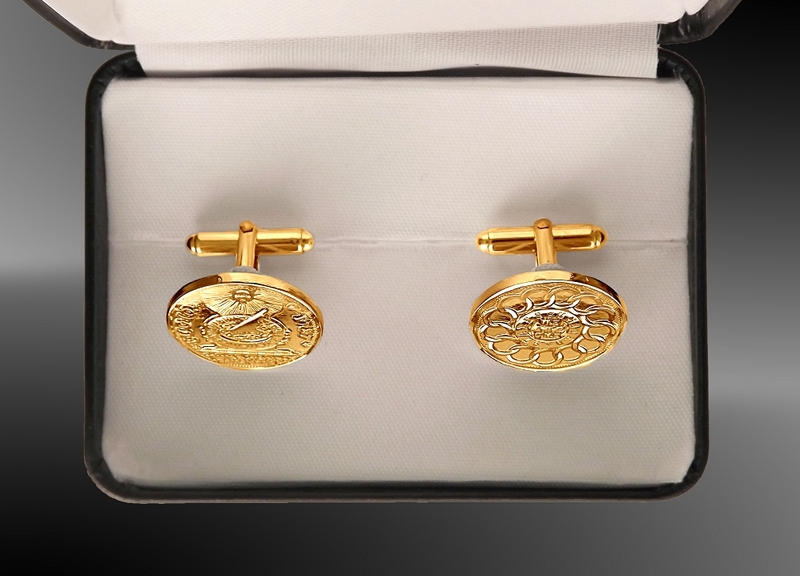 These unique cuff links feature the medallion pair plated with 18KT gold. The round backed swivel mechanisms are goldtone. Coin surfaces are protected with Aurista's exclusive LensCote clear polymer. Certificate of coin authenticity, uniquely numbered signet and limited lifetime warranty.